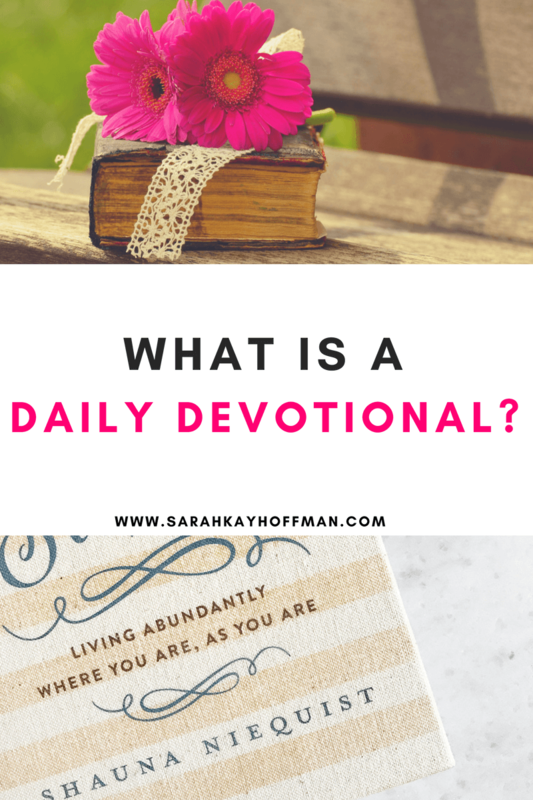 What is a daily devotional? I have been honing in on not only what they are, but also how to incorporate them into my life, and today I want to share more with you. To remind myself of its importance, and that I need to find myself in daily devotions. As a place to “start,” so that you could follow along from the beginning if desired. I stand for and beside The Bible. I stand for and beside my faith. I stand for and beside Jesus Christ because He changed my life and because I believe with all my heart that He is the only way. But here’s the truth….even though I stand for all of that, and love the Lord, I am not a good student on a daily basis. I do not spend time with Jesus, in The Bible, reading the things he taught and soaking up the life he desires us all to live. I feel a pit in my stomach with the idea that I wrote that on a day when I spent zero time on a daily devotion or in The Bible. This doesn’t make me a bad person. There is nothing I can do to make me “better” for Him. It just means that I need to shift to a place where a daily devotional is a priority because I desire to know Him better. So I’m starting here, with the daily devotional. What is a Daily Devotional? Publications which provide a specific spiritual reading for each calendar day. They tend to be associated with a daily time of prayer and meditation. Daily devotionals have a long tradition in religious communities, with the earliest known Christian example being the Gælic Feliré written in Ireland in the Ninth Century. The daily devotional can be broken down/performed in many different ways. So how will I do my daily devotional? I’m starting with Shauna Niequist’s Savor. And yes, the same Shauna who wrote Present Over Perfect that we are currently reading via my virtual book club. I met this really wonderful woman named Suzy at the Mayacamas Ranch Retreat, and we have stayed in touch. She grabbed Present Over Perfect upon my recommendation, and when she loved it so much to thank me, she sent Savor. It is a devotional for 365 days, but why it will work for me is because there is just one page for each day of the year, and each page includes one bible verse along with a short message and then a question at the end to ponder. It’s the right method for me in this season of life, and I’m guessing for many of you as well! Devotions I do that speak on a very personal level, I’ll share. When I write on it, they will be tagged and placed under Devotions. Do you do a daily devotional? Have you read Savor? I have been doing a daily devotional for a couple of years, pretty consistently. The devotional began with and continues to include Richard Rohr’s Daily Meditation via email. Love love love him. Speaks to my heart and soul. This year my church is reading the One Year Bible. Each days contains some Old Testament, New Testament, Psalms and Proverbs. I have yet to read the whole Bible in its entirety and this is a very manageable way to do it. So I have added that to the routine. I now also do a double dose of Richard Rohr – his daily email plus a a reading from A Spring Within Us which is a compilation of his daily meditation of 2014. But before I do any reading, I spend 20 minutes in Centering Prayer (sometimes called Contemplative Prayer) which is like meditation but different. All of this requires me to get up extra early, while the kids are still asleep, and the house is quiet. It is my favorite time of the day! 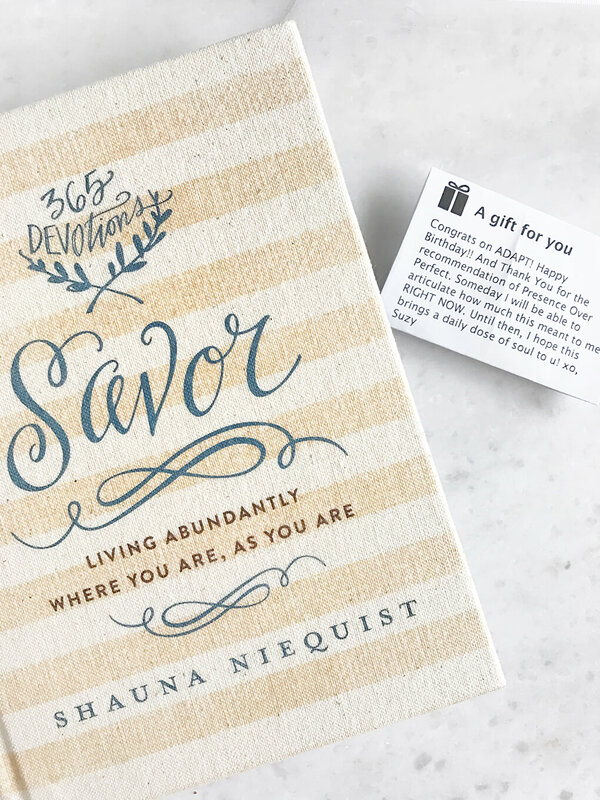 I recently added Savor to my daily devotional too though I tend to do that later in the day, when I need a break from the hustle and bustle and a reminder of my morning ritual which always seems far away, even by noon! Its a great source of grounding. I find myself feeling the same as you exactly. I have Savor, so I am using your post as inspiration and taking it off the book shelf today to use as it is intended. Thank You! I have done daily devotions in the past and have fallen off the wagon lately. Thanks for this nudge to get back to it! I sometimes fall in the trap of thinking a single verse or page isn’t enough, but it’s amazing how often it is exactly enough. Love this post! So much truth and humility. Before I had my third baby in April, I was super intentional about getting up before my two kids and spending time with God. Since he was born and my sleep has decreased substantially, I haven’t been as good about it. But I’m so thankful for grace and for the fact that we don’t have to be perfect for God to love us! I do my best to have a daily quiet time, and some days may be 5 minutes while other days may be 30. I do have Savor, but haven’t worked my way through all of it yet. I love Oswald Chambers’ “My Utmost for His Highest” which I’ve been through a few times. I also follow along with some of the She Reads Truth studies and there have been other various devotionals. But I always make sure that I’m reading the Bible, so if I only have 5 minutes, that’s what I’m doing. I’ve been following along this year with a Bible reading plan put together by Michelle Meyers :).